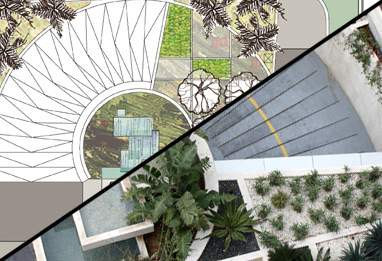 At ROOTS, our custom landscape designing begins the moment we first meet our client and begin to listen to his desires. The feedback from each client is a key element along each step of the design process. Through the services of our Landscape Design Department and the brilliant talents of our Landscape Designers and our Architectural Engineer, we meet with you at your property to determine the best landscape gardening ideas to enhance its natural beauty, draft an urban landscape design, or front yard landscaping plans, an outdoor garden design for your commercial building, a garden layout idea for your home, or a Mediterranean garden design for your back yard enjoyment. We assign a landscape architect to each project who meets with each client, views the site to be landscaped, and listens attentively to all personal desires and budget. The architect takes snapshots of the area, while participating in an in-depth question and answer session with our client to be sure all requirements are logged in to make each project uniquely individualized per the client's requirements. Our architect returns to the office to analyze the data he has collected to prepare two designs – hard and soft landscaping. The project architect consults with our draftsman and quantity surveyor along with the staff who will eventually execute the plan, so that the drawings take in all considerations. A preliminary bill of quantities for all materials is also created. We meet again with each client to gain approval of the landscape gardening ideas in the design, to incorporate all required changes, and then our Agricultural Engineer is consulted to advice on the use, functionality, climate and esthetics regarding to the plants chosen.